Fathers who want to keep on top of the latest nutritional recommendations for children may want to note that the leading children’s medical organization in the U.S. thinks kids need more vitamin D.
The American Academy of Pediatrics’ new guidelines increase the optimal amount of the vitamin from 200 international units (IU) per day to 400. But how do you go about following this parenting advice? The main source of vitamin D is sunlight, but health experts warn against too much sun exposure, due to the heightened risk of skin cancer. One solution is supplementation. Nutritional supplements already contain 400 IU, the AAP stated, explaining that few foods contain enough vitamin D to meet the daily requirements. "Supplementation is important because most children will not get enough vitamin D through diet alone," said Dr. Frank Greer of the AAP in a statement. 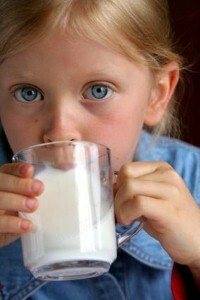 Milk is also commonly fortified with vitamin D, as are some cereals. You may also want to make sure your pregnant wife receives adequate amounts of vitamin D. Research has shown that the levels of this vitamin consumed by a baby’s mother can affect the child’s dental and bone health.